In keeping with WOU’s focus on staff engagement this year, the annual Hari Raya Aidilfitri lunch held at the main campus was indeed an engaging affair as staff took time to mingle leisurely over good food. Staff interacting at the gathering. The event held today was organised by the Muslim community of WOU, with the Information Technology Services (ITS) department and the School of Science and Technology taking the lead, and supported by other colleagues and the full-time studies Student Council. Ladies in a row...in attractive baju kurung. 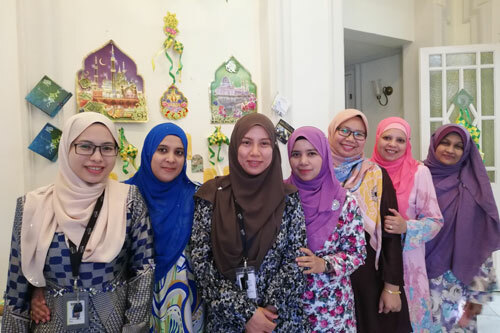 Many staff and students showed up in their colourful baju kurung attire, while the venue itself was decked with ketupat decorations, greeting cards and glitter. Everyone was presented a quaint door gift packet holding dodols of different flavours, and each table had plate servings of ketupat, lemang (glutinous rice) and serunding, along with generous helpings of satay with gravy, onions and cucumber. Receiving dodols in small packets as door gifts. Among the entertainment was the popular “Selamat Hari Raya” song by the late legendary songstress Saloma rendered by the Student Council president, Muhammad Farid Arsyad Foad, as he strummed the guitar. He was accompanied by fellow student Ooi Jie Wen on keyboard. Performance by Farid and Jie Wen. In her welcoming remarks, Prof Zoraini noted that Hari Raya Aidilfitri, like all other festivities, is an occasion for family reunions and open houses. She also shared a simple Malay poem that spoke about forgiving others and seeking forgiveness for any wrongs and slip-ups so as to foster closer relationships. Prof Zoraini reads a poem on forgiveness and relationships. The gathering was graced by Chief Operating Officer Yeong Sik Kheong, consultant Wong Hun Heng, School of Science and Technology Dean Dr Wendy Bong Chin Wei, School of Humanities and Social Sciences Dean Assoc Prof Dr S Nagarajan, along with Heads of Department and staff from the main campus. They feasted on rice served with fried chicken, mutton kurma, vegetable dalca and cucumber-pineapple salad, complemented with sliced watermelon and honeydew fruits, teh tarik and a sweetened drink. Generous helpings of satay and delicious dishes at the luncheon.